2015 marks the 800th anniversary of the Magna Carta, one of the most influential documents in history. It serves as the foundation for the English system of common law. 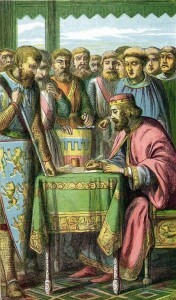 On the June 15, 1215, King John met with his barons at Runnymede on the Thames and signed the Magna Carta into effect. This 63-clause document is packed with details but most are not particularly significant. The major takeaway from the Magna Carta is that it limited the king’s power and granted the people specific rights. King John became king following the death of his brother, King Richard the Lion-Hearted, in 1199. Then kingdom went downhill quickly, as much of John’s reign was characterized by failure. He lost the territories of Normandy and Anjou, among to France. John also taxed the nobility heavily, creating friction among his subjects. He sold church offices to build up the depleted royal funds. He was particularly unfriendly with Pope Innocent III, which led him to become the first English sovereign to be excommunicated. King John was very unpopular. But perhaps none of his “failures” were quite as historically important as the creation of the Magna Carta. The final straw for King John’s subjects was when he lost in the campaign to reclaim Normandy in 1214. Stephen Langton, the archbishop of Canterbury, called on the barons to demand a charter of liberties from the king, thus taking away some of his power. When negotiations stalled in early 1215, civil war broke out. Before long John yielded and on June 15,1215 he accepted the terms of the Articles of the Barons (a.k.a. 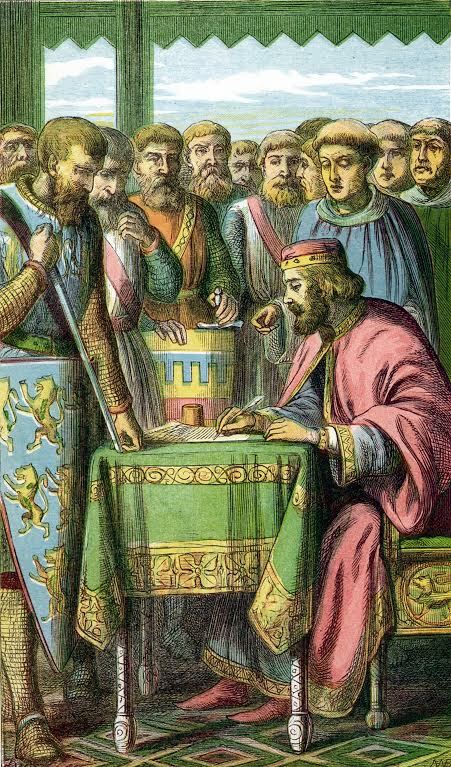 The Magna Carta), placing John and all of England’s future sovereigns within the rule of law. However, the initial charter failed in its goals. Within three months, Pope Innocent III had declared the Magna Carta illegal saying that John has signed it under duress and another civil war broke out. After John’s death in 1216, his son, Henry III, issued a revised version of the Magna Carta; the first of many revisions. The document was reissued again in 1217 and again in 1225, when it was formally entered into English statute law. All subsequent issues of the Magna Carta follow this version. Today, four original copies of the Magna Carta of 1215 still exist – one in Lincoln Cathedral, one in Salisbury Cathedral, and two in the British Museum – and memorials stand at Runnymede as a symbol of this site’s connection to freedom, justice and liberty. Want to visit these historic sites? Please contact AESU by calling 800-638-7640 or fill out the contact form found on our website. And don’t forget to check out all of our great Travel Tips, especially the Travel Tips for Europe, before you head overseas. This entry was posted on Thursday, March 26th, 2015	at 2:51 pm	. You can follow any responses to this entry through the RSS 2.0	feed. Both comments and pings are currently closed.